My three year old hot water heater stopped working on Feb 1 for no reason that would be obvious to me. I contacted Aire Max based on the ratings it had received on Homestars and the owner came within an hour. He unplugged it and plugged it in again and examined the heater. He asked me for a copy of the manual which does not inspire confidence. I gave it to him. About 15 minutes later he told me that the electronic panel on the hot water heater was not functioning and that it would cost $600 to replace it which does not seem worthwhile on a hot water that only cost me $1000. He told me he would be glad to sell me a new one and quoted on both tank and tankless replacement. He also commented on my furnace saying that it was a bad brand and that he could recommend a better one and could quote on that. I said that I would get back to him and did some research on the hot water heater models he proposed. Later the same day, I contacted Sears where I had bought the hot water heater and learned that parts for it would still be under warranty so I arranged for a service call. The next morning, I noticed that I had hot water. I kept the appointment with the Sears technician to get his opinion. He too asked for the manual and said that the electronic panel on the hot water heater was fine. He commented that sometimes hot water heaters with these electronic panels just need a reboot and that the act of unplugging it the day before would have done that. It is now three weeks later and it is still working as it should be. I am very glad to not have listened to the fellow from Aire Max. I would be out a minimum of $1500 if I had unnecessarily replaced a perfectly good hot water heater. Let me explain story from my side, you call me Sunday morning and around one hour after your call I was at your place.your water heater was not working, I restarted couple of times but it didn't come on. by the gas code even we are 100 percent sure about some thing and as a gas technician we have to take a look at manual to make sure every thing is fine. I recommended you if you want get rid of this problem it is better to have a better quality product which is yours is not a good one, next day before sears came, your water heater was on because of my reset, so after couple of call still you didn't pay my service call and I am also shocked why home stars established this review because I didn't get paid and no business happened, what kind of appreciation is this for work on Sunday!!!!!! The collar around this handheld shower had been broken for three years and one important part was missing. It was an especially ugly job because there was no way to access underneath the tub so it would be necessary to remove an expensive marble tile and hopefully not break it. Charlie studied the problem and we discussed various alternatives. 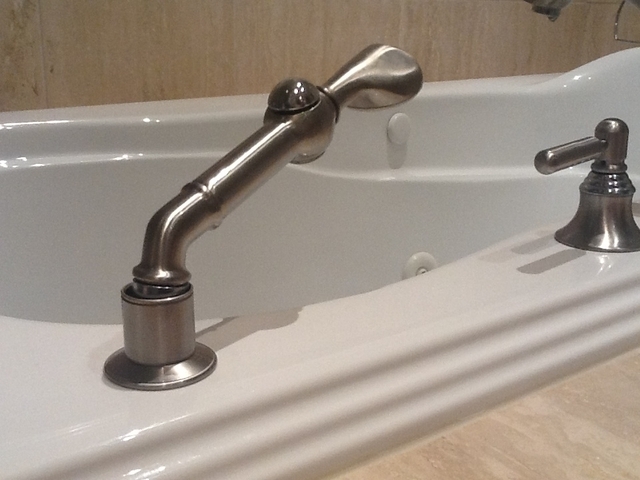 I did not really want to have to buy an all new fixture as it would not match the other bathtub fixtures. Charlie found a part on another plumbing piece that was extremely close to the original which was a great step one. He cautioned me that there was a strong liklihood that the marble tile would break and I accepted the risk.In a short amount of time, Charlie fixed a problem professionally that has bothered me for years. The tile did break; I found a spare in the garage and he replaced it perfectly. Charlie and his colleague also removed the wobbly wrought iron railings on both of my decks that had been put back incorrectly by a previous contractor. He placed them in the right location and secured them properly. Lastly, he replaced and caulked a number of outside vents. These may sound like small things but when you lack the skills, strength and time to do it yourself, it is a pleasure to find someone who can. Charlie did a great job and I will definitely call him again. I am already working on my next “to do” list. I appreciated his work ethic, timeliness, flexibility and especially his willingness to take on small, aggravating jobs. I needed to replace a wooden fence that had been removed by a neighbour. It was awkwardly situated as it backed onto the neighbour's property and extended over gap in a ravine. It also had to join onto an existing wrought iron fence. I obtained three quotes including one from Justin, my favourite "go-to" contractor. 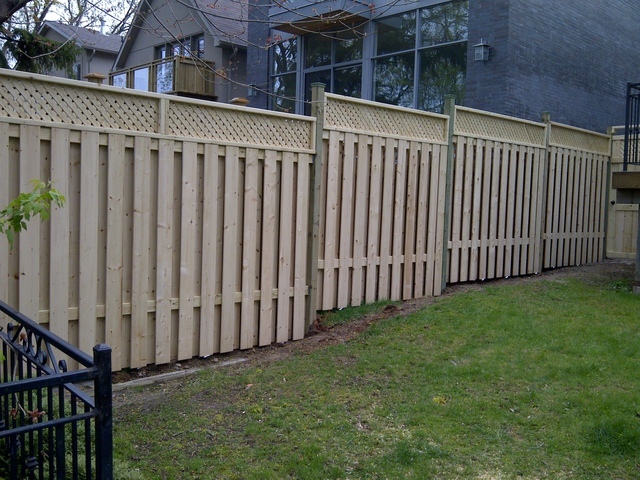 Alex from Toronto Fence and Mr. Mole provided a very competitive quote that came in $500 under Justin's. I would like to point out that Alex was the only one of the three that gave the quote in writing which I really appreciated. Even better, Alex was available sooner which was important to me as I need to get some landscaping done which includes grass so I could not wait until June to get the work done. 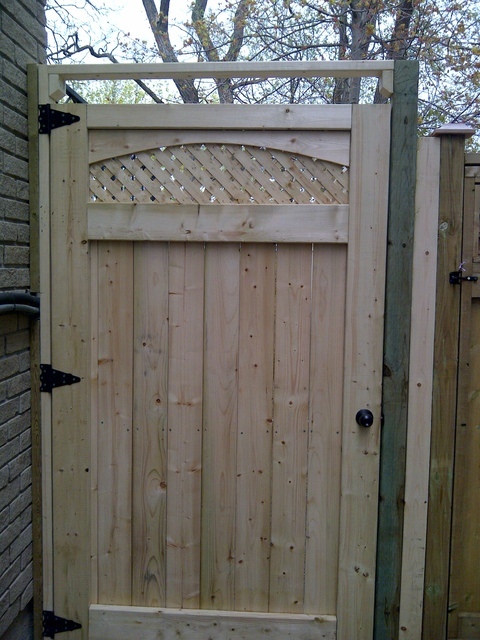 So I gave the business to Alex from Toronto Fence and I am so delighted that I did. The bottom line is that Alex and his father came in as scheduled, did exactly what I asked them to do to replace the gate and fence and charged a very competitive price. It was an effortless transaction. I am having them back in a few weeks to build an arbour for me as well. I can offer an unqualified recommendation. I have a small garden that I wanted to renew. Professional landscapers were quoting thousands of dollars to remove the existing grass and cement like soil bed. Rent a Son provided two strong men who removed the sod and soil and put them into paper bags for removal. they worked non-stop and kept the site neat and tidy. I would not hesitate to use Rent a Son again. This was a simple job - replace a downspout that had split in the back because it had been clogged with twigs over the winter. Another downspout joined into this one in a "Y" shape. I emailed photos to four contractors, three of whom quoted between $400 and $500 for the job. These guys spent too much time trying to explain how expensive eavestroughing is (shure!) and how difficult the job is. Pierce quoted $200, came and did the job perfectly on time and sent me an invoice. I didn't have to wait around for him - he came when I was not at home. It was so easy dealing with him. The other guys (two are listed on Homestars and got great ratings) were out to gouge me. I will work with Tip Top again. I contacted Forever Stone Design in mid-March 2010 to enquire about replacing the chipped slate tiles on the steps of my home with a more durable, attractive stone. Mimmo reviewed with me, an album of photos of previous jobs so I could make a selection of stone and design. He also made excellent suggestions about lifting the sagging walkway and replacing the stones there and along the driveway for a consistent look. We were very anxious to get the job done quickly because we are expecting overseas visitors for a family wedding shortly and we wanted to have everything looking great. Mimmo's crew did exceptional work over six full days even worked Saturday and Sunday)and made our steps look beautiful. Mimmo was present regularly to supervise the installation. Neighbours and perfect strangers have come by to admire the steps and pay compliments to the lovely job. The crew left everything perfectly tidy and took away all the detritus. The new steps are a vast improvement and we feel that it is tremendous value for money. We have had steps rebuilt at two other homes we owned prior to this by other contractors and by far this is the best job for the most reasonable price. I would not hesitate to recommend Forever Stone Design. My problem was twofold: dirty ducts from poor maintenance by the previous owner and more importantly, the finished basement of our ten year old new (to us) house was freezing cold all the time. In addition to cleaning the ducts, Paul investigated all of the ducts, made adjustments to baffles and vents among other fine tuning and the result is that our rooms are warm and comfortable to use. In addition (my idea), we turned the fan on the furnace and keep it on all the time which has made the basement the same temperature as the rest of the house. I wish I had called Capp's months ago. They did a terrific job.